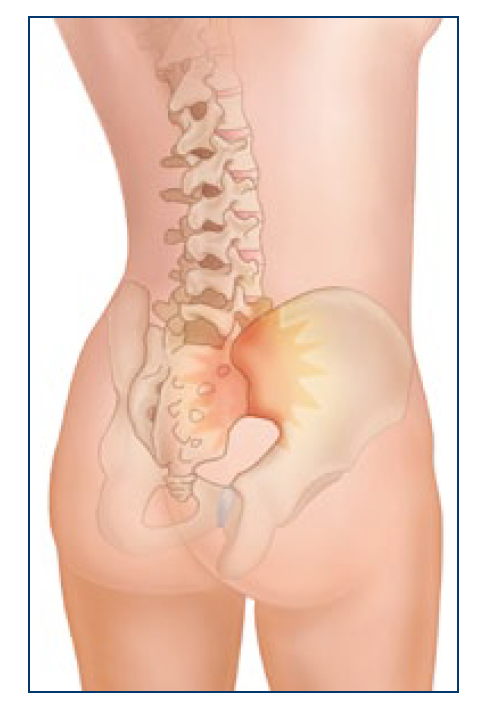 Many people suffer from Sacroiliac Joint Dysfunction even if they don’t know it by name. Most often people come in complaining of low back pain right along the belt line usually radiating to the glutes. They can usually point to the source of their pain and they point right to the S.I. joint. This is usually Sacroiliac Joint Dysfunction, and it can cause serious pain. It often affects pregnant women more easily than others because of the hormone-induced relaxation of the pelvis along with increased weight and low back stress. It is usually caused by trauma such as lifting heavy items while bending and twisting at the same time. It can be exaggerated by the same motion such as loading a dishwasher or front loading clothes dryer, or even vacuuming. SI dysfunction will often produce a functional inequality in leg length (one leg appearing longer than the other). This pain is often one sided and also confused with sciatica. If you have S.I. Dysfunction it can produce pseudo sciatica. S.I. Dysfunction is the cause of about 25% of all low back pain. What can you do if you have S.I. Dysfunction. Chiropractic is the treatment of choice having about a 75% success rate in research (http://www.ncbi.nlm.nih.gov/pmc/articles/PMC3804708/). Stretching the hip flexors and gluteal regions can help relieve some of the pain. The best thing to do is to see a chiropractor to restore proper function to those joints. If you have low back pain there is a 1 in 4 chance that it is S.I. Dysfunction. This entry was posted in Chiropractic in General on February 26, 2015 by cmnacnud.